When it comes to choosing a good toilet seat, you have to pick the one that doesn’t even let you notice that it is right there. Conversely, the worst seats are those that are inconvenient to set up or use. In other words, simple and effortless seats are the best. While buying a new toilet seat, we recommend you to find something that goes perfectly with your porcelain toilet’s shape. If your pan is D-shaped, then it will not fit with an oval seat. Therefore, look for such shape that resembles your fittings’ outline. To help you pick the right one, we have reviewed one of the best toilet seats out there, the Bemis 800EC 000 Toilet Seat. Find out if this is the toilet seat that’s perfect for your toilet! The Bemis Manufacturing Company is the world’s leading maker of toilet seats. The brand has been a reliable maker of all types of warehouse products since 1901. Other than designing toilet seats, the brand is known for its top quality non-automotive plastic products. Situated in the U.S., the Bemis Company provides packaging solutions for the everyday needs of millions of people. Be it food packaging, consumer products, medical or pharmaceutics, Bemis delivers firm and flexible plastic packaging for everything. Bemis has set a standard for ecological safety and conservation. To match its own standards, the company manufactures all of its products in an environment-friendly processing facility using nature-friendly materials. Similarly, the Bemis 800EC 000 Toilet Seat is one of their finest productions. Let’s take a look at what makes it stand out from its counterparts. The product is available in two universal shapes: round and elongated. The elongated one measures 47 cm or 18.5 inches from the center of the mounting holes to the front of the toilet bowl. On the other hand, the round one measures 42 cm or 16.5 inches. 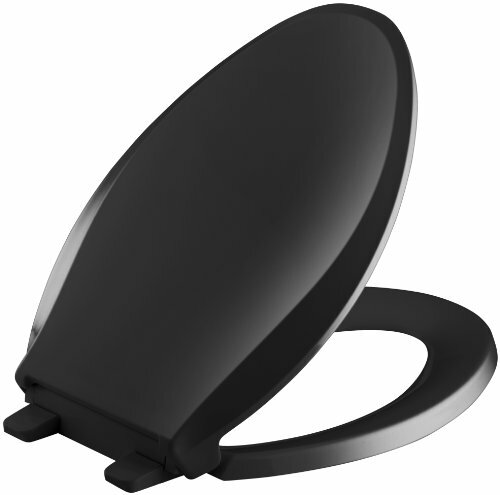 The unique design of the Bemis toilet seat fits with every round or elongated bowl from any manufacturer. However, every toilet seat doesn’t fit properly with all kinds of brands. Moreover, the Bemis toilet seat can also resist wears, stains, and chips. 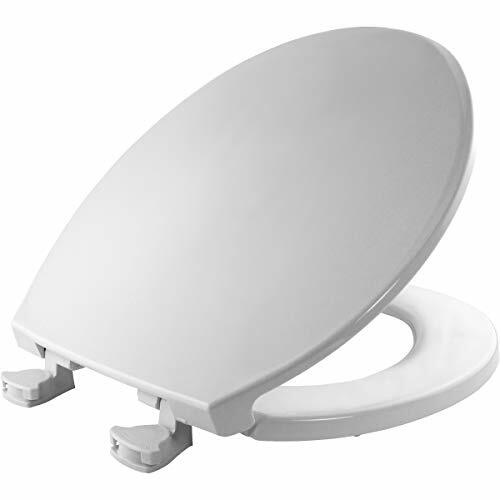 Made up of injection-molded solid plastic, the Bemis 800EC 000 Toilet Seat weighs only 4.2 pounds. This is a closed-ring type of toilet seat. Furthermore, the Bemis 800EC 000 features a built-in nut break off. With this feature, the bottom nut of the Bemis toilet seat breaks off when it reaches maximum tightness. Hence, it ensures the flexibility of your seat by keeping the tightness level within range. Available in three colors, the product matches perfectly with your bathroom interior. To list, you can find this unit in biscuit linen, white, or bone colors. Due to its detergent-safe quality, you can clean the product using any kind of mild detergent. Aside from that, you can also clean it easily with any sort of natural cleaners like essential oil, alcohol, or just plain water. Just wet your cloth with any of these cleaners, wipe, and it is all clean. The product features an STA-TITE commercial fastening system, which is rated as the best installation system. It keeps the seat secured and locked, making it a good option for kids and the elderly. Indeed, you can easily fasten your seat using this system. Just insert the bolt, tighten it with a spanner, snap it to lock, and you’re done. The Bemis 800EC 000 Toilet Seat comes with four bumpers, two hinges, bolts, and nuts. With its molded-in bumpers, non-corrosive hinges, bolts, and nuts, the product includes everything you need. In addition, the hinges and bumpers are color-matched as well so they won’t go against the whole color scheme. If you are looking for an innovative, stylish, and quality toilet seat, then nothing can beat the Bemis 800EC 000. Due to its two universal designs, the product can fit perfectly with any bathroom. Thanks to its comfortable built, the Bemis 800EC 000 offers unbeaten features and qualities that can make your everyday life easier. Not only that but with three available colors, there is also a good chance that you will find one that matches your overall bathroom interior. While comparing your options for a good quality toilet seat, you might come across other good brands. To be honest, you may find something that matches your budget perfectly. However, we want you to select the one that matches both your budget and standard. To help you compare and select the right one, we decided to compare the Bemis 800EC 000 with another excellent option—the KOHLER K 4636-7. For starters, from hinges to nuts, the Bemis 800EC 000 comes with all the essential hardware you need for its installation. On the other hand, the toilet seat from KOHLER offers only hinges and bumpers. Another key difference between the two products is the presence of STA-TITE technology. With this technology, the Bemis toilet seat never loses grip, stays sturdy, and keeps the bolt in the center of the mounting hole irrespective of the size. In fact, it never lets the seat shift or slide off. Besides that, it also makes the installation process a breeze. When it comes to measuring and holding weights, the Bemis toilet seat is way lighter than the KOHLER toilet seat. Being lightweight, the 800EC 000 is easy to carry and install. Other than this, it can easily handle a wide range of weights too. On the contrary, the KOHLER toilet seat can’t handle weights more than 200 pounds. With its easy installation and easy cleaning process, the Bemis 800EC 000 Toilet Seat is the ideal pick for residential use. The product promises excellent quality, perfect fit, and durability. To be precise, it is the best choice when it comes to comfortable and reliable toilet seats. No matter how much your weight is, this product is an expert in handling any kind of body. It is one of its kind when it comes to stability and tightness of the seat. Due to these features and qualities, we believe that the Bemis 800EC 000 Toilet Seat is a wise investment.